Anyone who has included emerging markets in their portfolio has arguably suffered in terms of overall performance. While predicting tomorrow is nearly impossible, it’s worth noting that growth in emerging economies is likely to be higher than the U.S. If inflation excitement kicks in here, then it only furthers the argument that emerging markets have serious upside potential on reflation bets (and hopefully sustained momentum). For the 592nd time, it looks like emerging markets are set to rally. By far and away, the most frustrating investment/trade/thesis has been betting on anything but US equities (SPY), and particularly positioning long into emerging markets (EEM). No words can describe that degree of frustration. Doing a simple backtest of various popular technical trading indicators would have resulted in tremendous whipsaws over the last 10 years, and cheap valuation simply hasn’t translated into price momentum. Anyone who has included emerging markets in their portfolio has arguably suffered in terms of overall performance, and anyone who has traded them wishes they were never a part of their opportunity set. At some point (hopefully in my lifetime), the secular trend of frustration will end and emerging markets will have a cycle that favors them. Maybe it finally has started. A lot of technicians will note several key breakouts from what looks like a classic U-shape appearing in emerging market indices, and economists will note that manufacturing and non-manufacturing PMI in China (FXI) is picking up in the near-term. Don’t forget the very long-term. 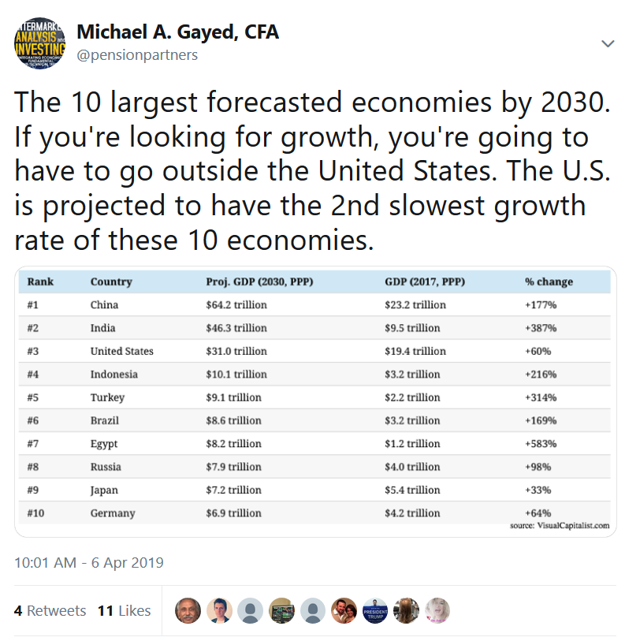 While predicting tomorrow is nearly impossible, it’s worth noting that growth in emerging economies is likely to be higher than the US. At least in the near-term, there are some positive signs. How does this jive with my recent Real Vision interview (The S&P 500: Things Don't Look Quite Right | Real Vision) though? 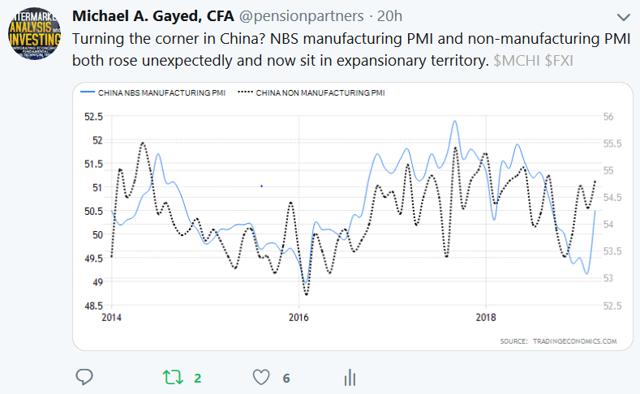 In it, I argued that things “don’t look right” for markets, given lingering strength in Utilities (XLU) and Treasuries (TLT), and that if these areas were foretelling something ominous that it could result in a retest of the December lows. At around the 12 minute mark, I was asked what would change my more negative thesis. I stated that if the intermediate became the short-term I would be more inclined to think stocks go higher led by Oil (USO) prices trending up, and cost-push inflationary pressure increasing. That appears to be happening here. Key to this? Inflation expectations (TIP) playing catch up. If the below ratio does not begin to meaningfully tick higher, I maintain a Spring Crash in equities can happen putting December lows at risk for equities. However, if inflation excitement kicks in here, then it only furthers the argument that emerging markets have serious upside potential on reflation bets (and hopefully sustained momentum). Our ATAC strategies in the near-term have been catching some good momentum as relative strength still looks early in emerging market stocks. Then again, this has happened 591 other times (:sarcasm:). Keep watching Oil and inflation expectations. I believe the narrative around what happens next will purely center around that and how that macro trend impacts everything else in the world.